Error: we could not find this location. Please check your entry or click the "See All Cities" link below. Unfortunately, we did not detect the Flash plug-in on your browser. Installing Flash will let you play content on the site. To download the latest version, click here. To edit your Favourites or customize your e-mail preferences, go to My Ticketmaster. Customize your e-mail preferences and more on My Ticketmaster. This list is subject to change without notice. Also, it does not necessarily reflect performance order at the event. 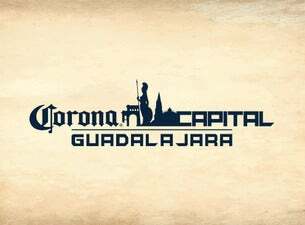 You're in the loop for Corona Capital Guadalajara! We'll email you before tickets go on sale in your area. Have more than just one favorite artist? Let My Ticketmaster keep track of all of them for you. Has your taste changed? Use My Ticketmaster to find some new favorites! Get email alerts and never miss an onsale for Corona Capital Guadalajara! Error: please enter your e-mail address. Error: that is not a valid e-mail address format. Please try again. Error: please enter your postal code. Error: this postal code entered is invalid. Please try again. Error: you are currently registered for a different area. To change your area, please visit My Account and update your Profile. There are no matching events in Mexico. Click "Get Ticket Alerts" to be emailed before tickets go on sale. Which Corona Capital Guadalajara event are you going to? Sorry, we're having trouble connecting to Facebook at the moment. Please check back in a couple of minutes, we should have this resolved shortly. Find out who loves live entertainment as much as you! Ask your Facebook friends to connect to Ticketmaster Mexico. Check here the notices in compliance with our commitments with COFECE.